1.1.4. Title 1, 4, etc. 1.4.1. See Staten Island's Tech Team Template! 2.3.2.1.2. creating a "portal" of shared folders called curriculum resources"collections"
2.3.4. Standard: ISTE STANDARDS FOR EDUCATORS: 4. Collaborator: Educators dedicate time to collaborate with both colleagues and students to improve practice, discover and share resources and ideas, and solve problems. 5.2.1. 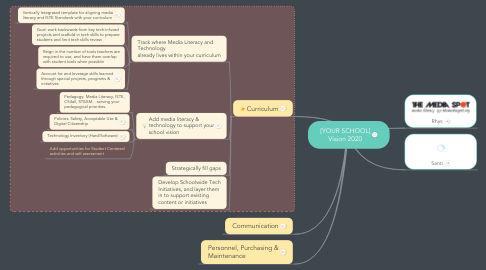 Pedagogy: Media Literacy, ISTE, CS4all, STEAM... serving your pedagogical priorities. 5.2.1.2. Apply the NYCDOE Core Vision for Technology to reinforce and expand your school vision. 5.2.1.3.1. 1: MLE requires active inquiry and critical thinking about the messages we receive and create. 5.2.1.3.2. 2: MLE expands the concept of literacy to include all forms of media. 5.2.1.3.3. 3: MLE builds and reinforces skills for learners of all ages and requires practice. 5.2.1.3.4. 4: MLE develops informed, reflective and engaged participants essential for a democratic society. 5.2.1.3.5. 5: Media are a part of culture and function as agents of socialization. 5.2.1.3.6. 6: People use their individual skills, beliefs and experiences to construct their own meanings from media messages. 5.2.3.1.6. Who's buying? Who's installing? How will kids log in? 5.2.3.2.1. how many? where? what kind? who has access? 5.2.3.3.1. how many? where? what kind? who has access? 5.2.3.4.1. how many? where? what kind? who has access? 5.2.3.5.1. how many? where? what kind? who has access? 5.3.1. Guiding Question: How can students constructing and sharing knowledge through curation of online resources (ISTE 3c) enhance our current units of study or initiatives? 5.3.2. Guiding Question: What digital skills will they need to accomplish that, and where in the curriculum is it most efficient and synergistic to build those skills?